BOSTON — The route of animated film to live stage production has worked out pretty well for Disney Theatricals. Animated movies such as “Beauty and the Beast,” “Aladdin,” “The Little Mermaid” and “Tarzan” have all made the transition to the stage with varying degrees of success , but it was the 1994 animated film “The Lion King” that turned into the theatrical jackpot at the end of the animated rainbow. Since its Broadway premiere in 1997, 22 global productions have been seen by 70 million people, with more than $6 billion in worldwide box office, more than any film or entertainment title in history. The 2004 touring production re-opened the Opera House on Washington Street, and it has returned a decade later to enthrall those who weren’t quite old enough to see it the first time and those who just want to enjoy the magic again. From the opening parade of the magical “animals” assembled through the imaginations of Julie Taymor and Michael Curry — Taymor designed the costumes and she and Curry co-designed the masks and puppets —- you’ll be dazzled by a menagerie that includes birds, an elephants and rhinoceros, giraffes, antelopes, ostriches, and wildebeests. With its breathtaking design, “The Lion King” turned Broadway on its ear, earning six Tonys, with Taymor becoming the first woman to win the Tony for Best Direction of a Musical. The score is a marriage of the pop skills with African rhythms, with Sir Elton John’s music and Tim Rice’s lyrics, augmented by additional music and lyrics from several sources, including Lebo M, who provided the distinctive African rhythms and melodies. It’s the story of a young lion named Simba (Jordan A. Hall on opening night), heir to the throne of the Pride Lands. He and his father, King Mafusa (L. Steven Taylor) are the master of all they see from atop Pride Rock. Scar (Patrick R. Brown ) is the malevolent if lazy brother of Mafusa who eyes the crown. He employs a pack of hilarious hyenas (played by Jacquelyn Renae Hodges, Robbie Swift, and Keith Bennett) to carry out some of the dirty work he needs done, dirtying his own hands only to arrange the wildebeest stampede that takes Mafusa out of the picture. When he then blames Simba for his father‘s death, Simba decides to abandon the pride in disgrace. Ultimately, the grown-up Simba (Jelani Remy) will return and reunite with his childghood friend Nala (Nia Holloway), setting the stage for a confrontation with Scar. By the way, an autism-friendly performance of “The Lion King” will take place on Saturday, Oct. 11, at 2 p.m. Special reduced ticket prices for the performance will be in effect. For more information, go to http://www.AutismSpeaks.org/lionking. 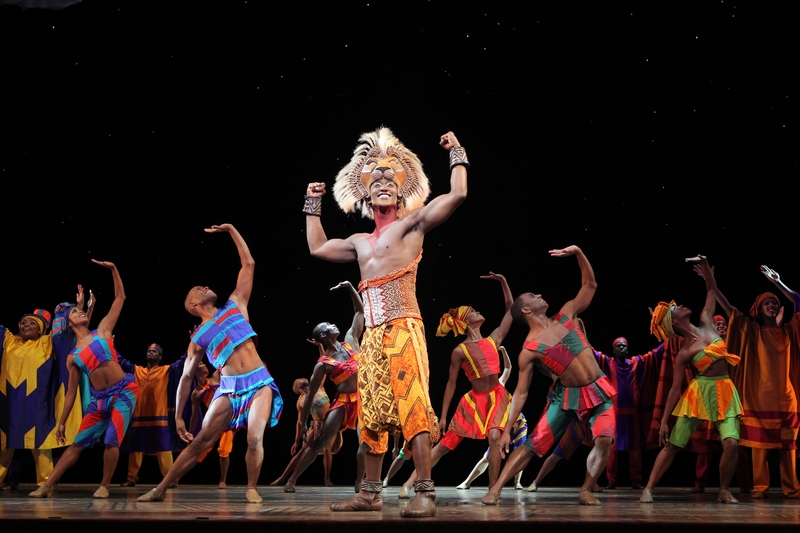 “The Lion King” is fine for first-time theater-goers six and above. It remains, 17 years after its debut, one of the great theatrical spectacles of all time. Sit back and let it wash over you. 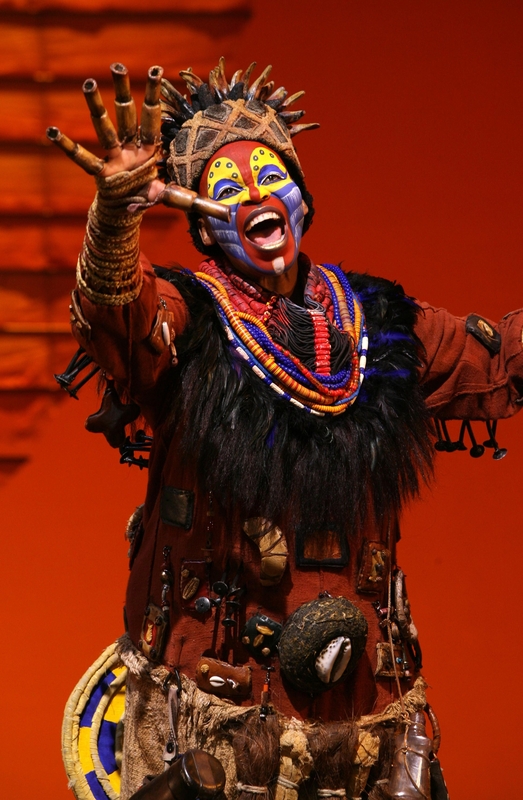 The Disney Theatricals Production of “The Lion King,” now through Oct. 12 at the Boston Opera House Writers:Music and lyrics by Elton John and Tim Rice. Additional music and lyrics by Lebo M, Mark Mancina, Jay Rifkin, Julie Taymor, and Hans Zimmer. Book by Roger Allers and Irene Mecchi. Adapted from the screenplay by Mecchi, Jonathan Roberts, and Linda Woolverton. Director:Taymor. Resident director, Deborah Shrimpton. Other Credits:Choreography, Garth Fagan. Set, Richard Hudson. Costumes, Taymor. Lights, Donald Holder. Mask and puppet design, Taymor and Michael Curry. Sound, Steve Canyon Kennedy. Music supervisor, Clement Ishmael. For more information and tickets: http://www.broadwayinboston.com.